If you’re anything like me, you need a large amount of coffee to get you going in the morning, and even more later on to keep you going throughout the day. But at some point, too much caffeine actually starts working against you. But this is 2014 -- there’s no need to guess at the right level of caffeine you need to ensure a jitter-free day and a good night’s sleep. Jawbone has released a new iOS app today called Up Coffee to help you track and manage your caffeine consumption throughout the day. Think of Up Coffee as your caffeine diary. The caffeine content of commonly available items like Starbucks Double Shot Macchiatos, cans of Coke and shots of 5 Hour Energy is already programmed in, allowing you to easily add items to your daily caffeine journal with a couple easy taps of the finger. This intake is measured against your height and weight, giving you a good estimate of how wired you are over time. 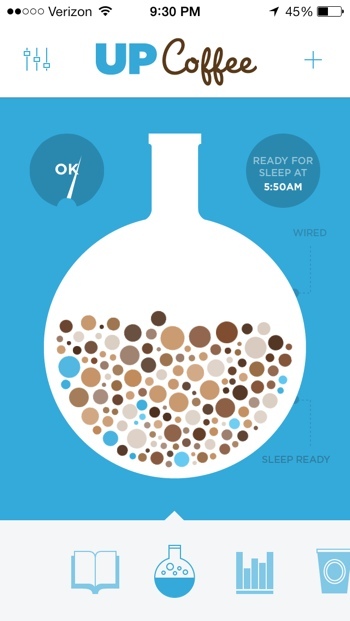 You can even set a preferred bedtime so the app can alert you when to switch to decaf for a solid night’s sleep. For a more personal touch, the app is able to connect to Jawbone UP activity monitors and sleep trackers. That lets you analyze your own sleep habits against your caffeine intake, giving you a better understanding of exactly how the drug affects your body. You can find Jawbone’s free Up Coffee app on the Apple App Store. No Android version is available from Jawbone yet, though the free Caffeine Tracker Lite app for Android performs many similar functions.